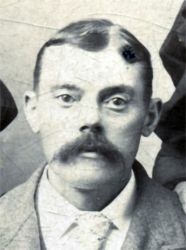 Left Sweden for the US (without family) in August 1885 (registration date 11 August, departed Göteborg 14 August) and worked as a mine blacksmith in Leadville, Colorado. 1910 US Census indicates that he emigrated in 1890. 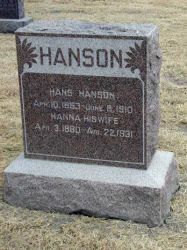 In US, “Hanson” surname was used. Moved to Holbrook, Nebraska on 24 September 1891. [S136] Gotländska släkter (Gotland families), Olle Överby. [S4950] Obituary of Hans Hanson. [S4949] Obituary of Hans Hanson. [S4948] Personal conversation with Jo Ann Mohr (née DeVries).